Email This Front Page | Subscribe | Random Post! We have briefly covered Attock Bridge in our earlier posts at ATP titled: The Bridges of Pakistan and When Kabul Comes to Attock. Today’s whole post is dedicated to this great bridge’s importance in Pakistan’s Railway network, its history, salient features and its current condition. 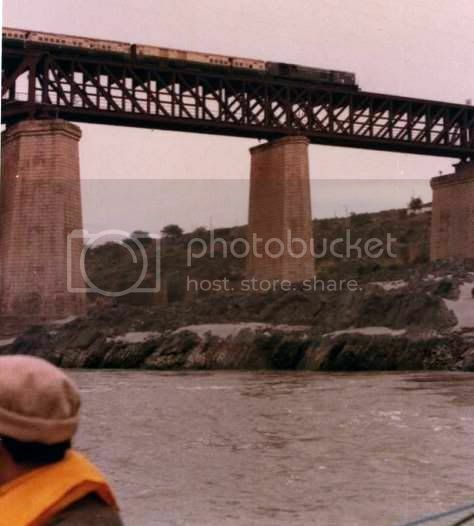 The photo of Attock Bridge above is circa 1999 and courtesy of Malcolm Peakman. Double header Steam locomotives are binging a tourist special over the bridge. As soon as the British annexed area around present day Punjab-NWFP boundary, they started working on the idea of bridging Indus at Attock. The crossing at Attock was considered very important for military strategic reasons. In 1853, one Colonel Crommelin proposed two designs, both which made use of suspension bridges to cross the Indus. While this design didn’t go forward, British provided a better bridge of boats for winter, ferry boats for summer and a light rowing boat for daak (postal services). Click on the photo above to see its larger image. 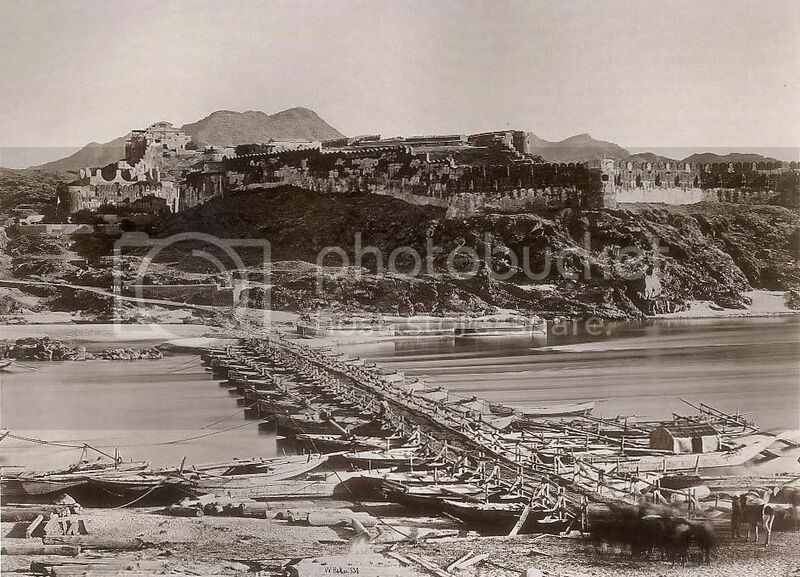 This photo was taken in 1863 by William Baker and it shows the Bridge of Boats at Attock as well as the famous Attock Fort. In 1865, Colonel A. Robertson summarized three types of projects that were being thought of to cross Indus at Attock. While projects proposing boats and ferries didn’t go farther, the idea of digging a tunnel under Indus at Attock actually got to working stages. The dimensions I propose for the tunnel inside are twenty-four feet wide by twenty feet in height, and a lining under the river of brick masonry two feet thick. This places foundation level of the roadway 82 feet under the low water level, and placing the entrances one hundred feet above this level for safety, we have 182 feet to descend and ascend. The grade I propose is 1 in 20; this is rather steep for railway traffic but offers no difficulties for normal road traffic. The width of the river bed at the point I have selected for the tunnel is 1215 feet. The photo above is the drawing of the tunnel which was built to near completion under the river bed at Attock. Clicking on the photo above will take you to its larger size and a better readable image. As a result of the detailed report from Colonel Robertson, of which an excerpt is given above, British Government sanctioned Rs 10000. Work started on building this tunnel on 12 March 1860. In June of same year, water leakage in the tunnel works made the project suspended for few months. In January 1861, another grant of Rs 10770 was approved but work never caught pace. Some heavy machinery could not be obtained on time and work got suspended again from May to November of 1861. In summer of 1862 another machinery breakdown caused the work to stop. By now British government had spent Rs 59300 which was far more than the original estimate. At this time work was stopped until a study could be made about all the challenges and causes of delays. 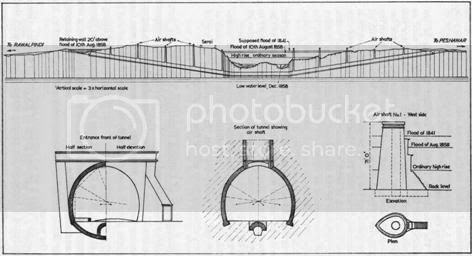 When work stopped on the tunnel only 258 feet distance remained between the two ends of the boring to meet under the bed and complete the tunnel. This is an amazing piece of history related to bridging effort of Indus at Attock. I don’t think many people know that a tunnel was dug here which came as close as 258 feet of making a thoroughfare before it was abandoned. Does the Tunnel Under Indus Bed at Attock Still Exist? I don’t know. But I would love to know. I wonder if the two ends of tunnel are still there? Does the tunnel ends still go under river bed or is it by now totally flooded? Do any of our informed readers know? One reference  tells us that by 1862 water leakage in the tunnel had become so serious that men at work could not keep up with drainage, and the project was shelved. 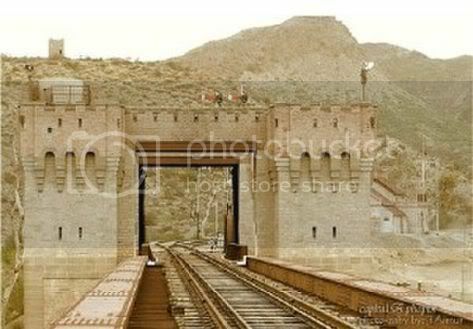 No one tried to build another permanent crossing at Attock for the next 20 years until another war with Afghanistan occured and this time the British orders came to finish the railway track up to Peshawar at all costs. 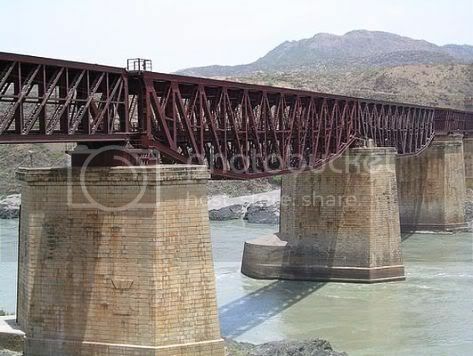 The Attock Bridge on the Indus was originally designed by Sir Guildford Molesworth (1828-1925). Guildford was also the first General Manager of Sri Lankan Railway, which was then called Ceylon Railway. The bridge is located about 80 km (50 miles) south west of Peshawar and forms one of the most important strategic and commercial crossings on the Indus. The structure was designed and constructed by Sir Francis O’Callaghan and Mr. Johnson. The place where Bridge is built used to be 600 ft wide during winter months. In the center of the river there is a huge shallow rock. It was considered to form the foundation of center pier. All other foundations were above water and presented no serious difficulty. The bridge consisted of 5 spans. Three of them are 257 ft long and two are 312 feet long. The latter were, at the time, the longest in India. The girders were of double intersection type carrying the railway on a floor system attached to the the top booms and the Grant Trunk Road on a floor supported by the lower booms. 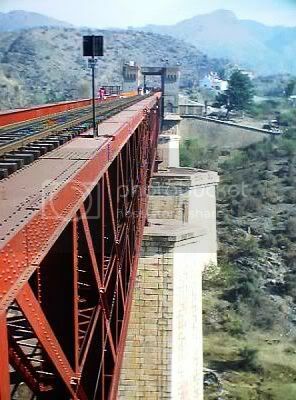 At the time of cnstruction the Attock girders; 26 ft deep; were the largest erected in India. The cost of the bridge was more than Rs. 3.2 million. 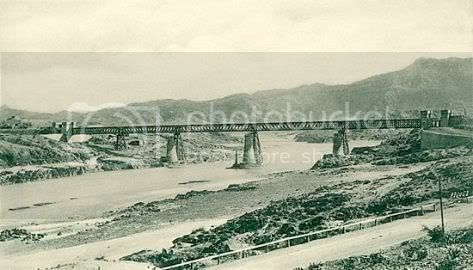 Attock Railway Bridge opened for traffic on 24th May 1883. An artist’s rendition of the Attock Bridge under construction in 1883. 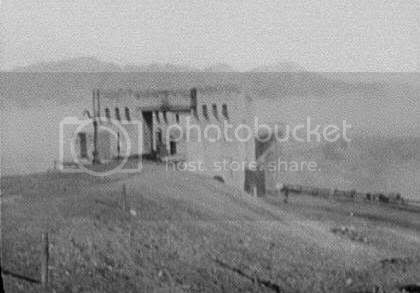 Following two photos are one of the earliest documented images of Attock bridge. They were taken in 1895. Photographer is William Henry Jackson (1843-1942) who visited Attock bridge as part of the World Transportation Commission (1894-1896). 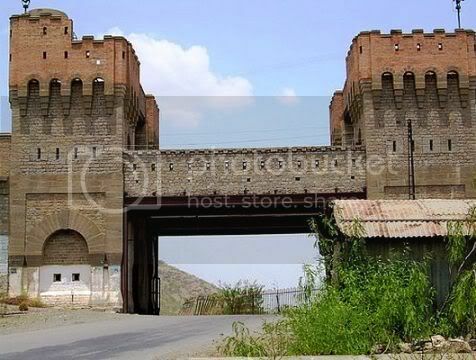 The first photo shows the approach to fortified bridge over Indus at Attock. Following photo was first published as halftone in Harper’s Weekly on September 4, 1897. The steam train over the bridge is being pulled by a famous ‘L’ Class 4-6-0 Steam locomotive. 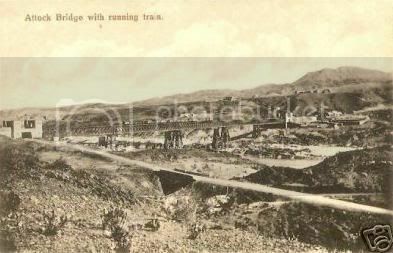 Following photo is from 1900 and shows a freight train on Attock Bridge. Note the fortified entrance to the bridge as well as the state of unpaved Grand Trunk Road (now highway N5) which used the lower level of the bridge. 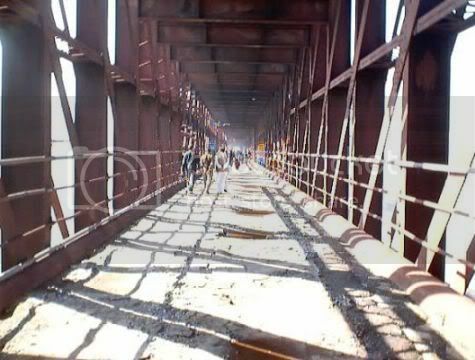 The first Attock bridge lasted more than 40 years. In 1921 it was found that the spans had lost camber and had become distorted. Besides, many members were seriously over-stressesd under the existing train loads, and it was necessary to renew the longer spans and to strengthen the shorter ones to enable the passage of heavier loads under contemplation. The speed of all trains was consequently lowered to 5 mph on the bridge, double-heading with certain classes of locomotives was forbidden. Heavy road traffic on lower level was also restricted at the same time time when a train was crossing overhead. During reconstruction phase in 1927, an examination of the central rock foundation came as a shock. The whole of the downstream side of the island had been under mined to a distance of 10 feet. Half of the trestle rested on an overhang of a decaying rock. The overhanging rock was later cut away and it was replaced with concrete reinforced with rail pieces whose total length came out to be more than 3 km. This formed the new bridge foundation which is standing firm to date. The bridge was reconstructed by replacing the longer spans with new steel girders erected outside them and converting the old main girders to continuous girders by the erection of a central pier in each span. The bridge reconstruction, carried out a cost of about Rs. 2.5 million was the work of Mr. W.L. Everall. It was particularly difficult because it had to be executed entirely during the intervals between the passing of trains, the maximum uninterrupted time available being three hours and usually only about one hour. The reconstructed bridge was opened on 30th August 1929. It carries a single broad gauge line. Following photo is courtesy of Malcolm Peakman. 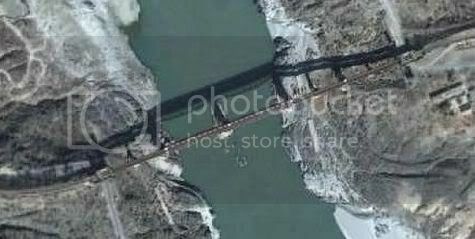 Following is the satellite image of Attock Bridge from Google Earth. A larger and much more detailed satellite image of the bridge can be seen here. Following photo is from 1920. This road bridge once formed part of the famous Grand Trunk Road (now highway N5). 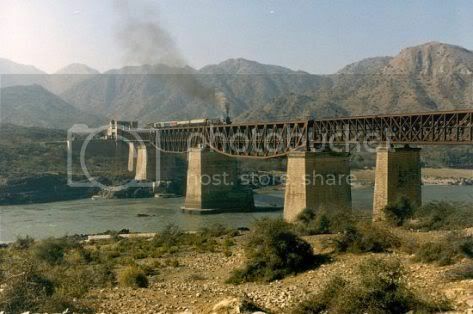 A new road bridge was opened to cross Indus at Attock in 1979 and that left the road bridge of Attock rail bridge to slowly decay because of lack of maintenance. Following photo is from BBC correspondent Mark Tully’s visit to Attock in 1993-94. Another photo showing current state of disrepair at lower road level of the bridge. Huge holes on the road surface are pretty evident. Our readers may be aware that almost all the railway lines in Pakistan which lie west of river Indus were built for military or strategic reasons, that is why one can see fortified entrances with turrets on almost all the tunnels and bridges west of Indus. For example Lansdowne Bridge Sukkur, Khojak Tunnel, almost all the tunnels in Bolan Pass, almost all the bridges on Sibi to Harnai route and Attock Bridge have fortified entrances to guard these installations as strategic assets. Even Lahore railway station has turrets to defend it as a strategic asset. Following photos show the fortified entrance to the Attock bridge. Following photo is courtesy of Malcolm Peakman – 1999. The photo to the right shows this historical and original plaque dating 1880. See here for the close up of the text written on it. It reads 19R – Westwood Baillie and Co – Engineers & Contractors – London – England – 1880. 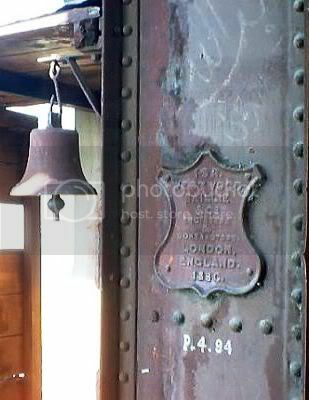 The bell shown in the photo was used to announce the arrival of trains in the bridge. Also note the original rivet work done on the bridge here which is held strong even after 126 years of bridge’s construction. Both photos below are courtesy of Dr. Ali Jan and were taken in January 2004. The reconstruction of Attock Bridge is particularly remarkable for the splendid work done by the Indian workmen employed by the North Western Railway Bridge Department. Teddy Gelson was the resident engineer on site and he was most ably assisted by the two bridge inspectors, Sardar Sahib Prem Singh and Karam Elahi, whose skill in bridge-building was to become known throughout the north of India. Sikh and Moslem, these two brilliant leaders, barely able to read and write in English, carried through to successful completion of one of the greatest bridge reconstruction works ever taken in India. The steelwork for the two 312-feet spans had arrived on site before the end of November 1928. These men, with their respective gangs working in friendly rivalry from the two ends of the bridge, had it up and riveted complete and all the erection gear dismantled and sent away in under four months. This is a pushto song by Rahim Shah sung at the lower level of Attock Rail bridge. There are glimpses of few trains as well as shots of the famous Attock Khurd Railway Station with famous Victorian architecture station building. 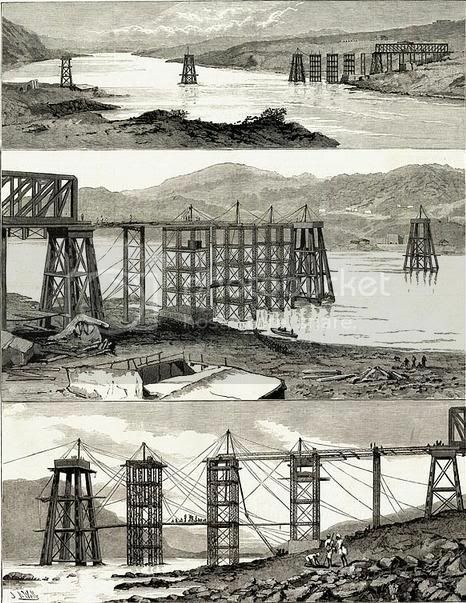 1853: Colonel Crommelin proposed 2 designs which made use of suspension bridge to cross the Indus. 1859, Colonel Robertson proposed the idea of a tunnel crossing under the river bed at Attock. 1860: Rs 10000 were sanctioned by the British to build a tunnel under Indus river bed at Attock. 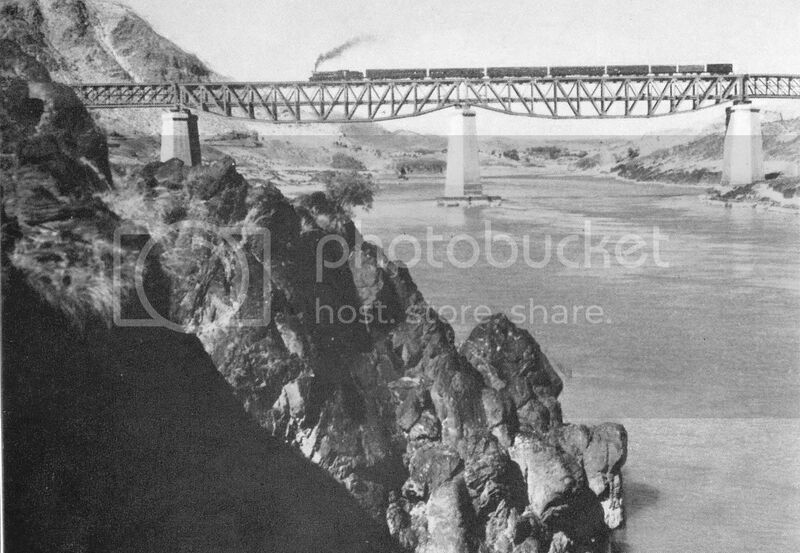 March 12, 1860: Work started on building a tunnel under the river bed of Indus at Attock. January 1861: Rs 10770 were sanctioned for the tunnel work. This was the second installment. Summer 1862: The main shaft which was being used in tunnel boring broke down and so ended the plans for finishing the tunnel. 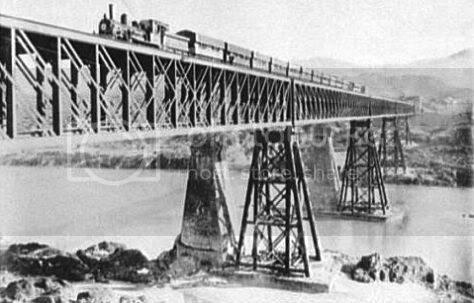 1879: A war with Afghanistan got the orders from British to complete the railway track upto Peshawar at all costs and this included a bridge on Indus at Attock. February 1880: Work started on laying the foundation of the pier which was in the center of the river and was to be built on a shallow rock under water. October 1880: Girders for building the Attock Railway bridge started arriving at the site. November 1981: Water was pumped out of the compartment made across central river pier position. The compartment was made out of cotton bags and after the water was pumped out, the rock was examined on which the foundations of central pier were to be laid. February 6, 1882: The first column shoe of the river trestle was placed in position. 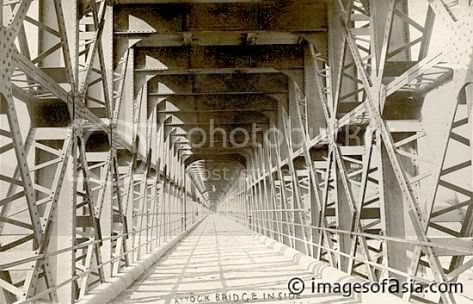 May 1882: All trestles of the bridge were completed. 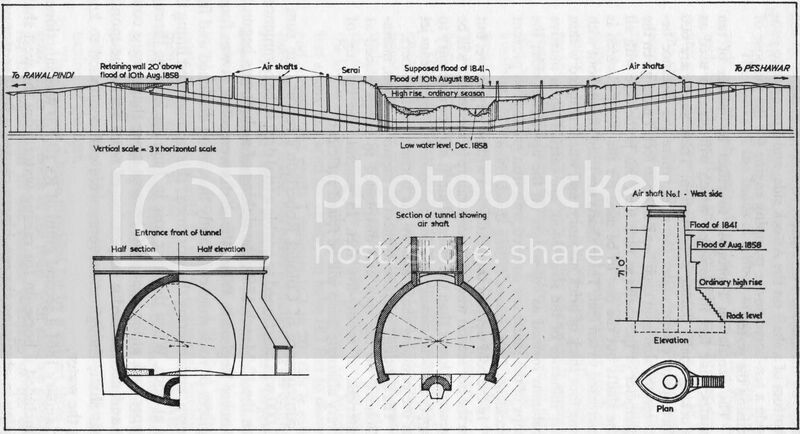 October 9, 1882: Bridge staging was started. The stagings were made of timber and they hold the weight of bridge span during construction phase. 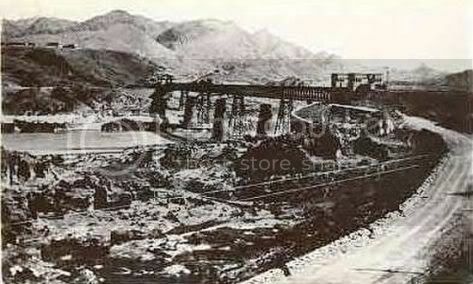 1882: Railway track got completed from Peshawar to Attock, with river crossing still incomplete. February 1883: Second bridge staging was completed towards the end of this month. March 3, 1883: Last span of the bridge was completed. March 31, 1883: An earthquake in the area shook the bridge girders so violently that they were displaced 1 inch out of position on the tops of the trestles. No other major damage happened. April 15, 1883: By this date, all the staging timber was removed. 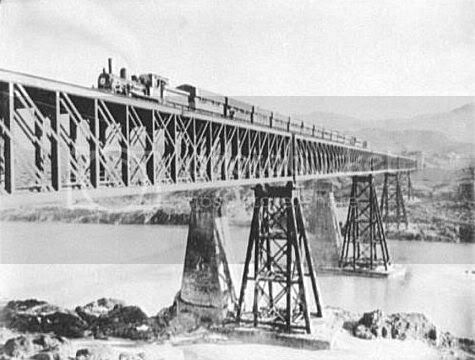 May 5, 1883: First locomotive passed over the Attock bridge. May 24, 1883: Attock Railway bridge was completed and opened for traffic. Trains could now run between Karachi and Peshawar on a continuous track. 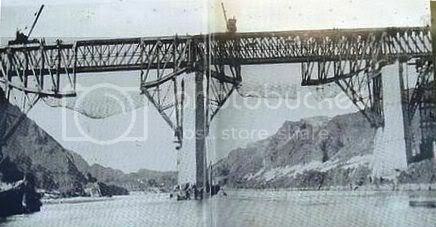 1921: It was found that the spans had lost camber and had become distorted. Besides, many members were seriously over-stressesd under the existing train loads, and it was necessary to renew the longer spans and to strengthen the shorter ones to enable the passage of heavier loads under contemplation. 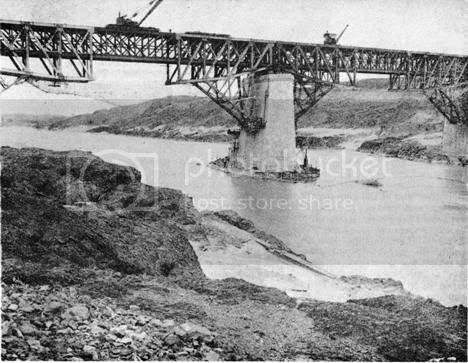 June 1925: Work was authorized for the reconstruction of Attock Bridge. 1927: An examination this year showed the rock under the trestle to have been highly undermined and dangerous. November 1928: Steel work arrived on site for the two 312 ft long spans before the month end. August 30, 1929: The reconstructed bridge was opened for traffic. I have been fortunate enough to cross this historic bridge both by rail as well as by road. In 1979 we were travelling from Faisalabad to Peshawar by car. 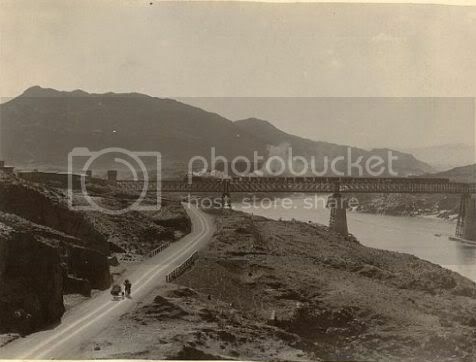 The New Attock road bridge had not opened yet and the famous Grand Trunk Road used lower level of Attock rail bridge. I remember the road level of the bridge was one way traffic and we had to wait 15 minutes or so before our side of the traffic was let go. On our way back from Peshawar, we took an overnight train called ‘Abaseen Express’ to Lahore. 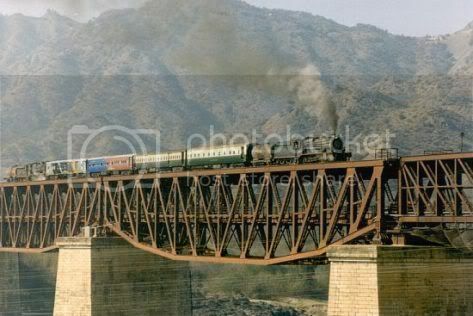 The train left Peshawar at 6:30 p.m. and I remained awake till 10 p.m. especially to see Attock bridge by rail. When the train crossed the bridge, I had my neck hanging out of train window. I could see lights of road traffic on lower level and I still remember seeing roaring green-blue water of Indus right below the bridge because of some lights there but everything else was in pitch dark. 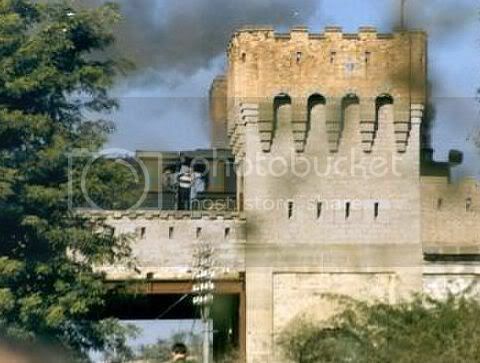 These nostalgic images of Attock bridge have been imprinted in my memory since then. If you want to learn more about Pakistan Railways, then feel free to join the Pakistan Railway (PR) discussion group. Everything and anything related to PR is discussed here e.g. preserving of Pakistanâ€™s rail heritage, steam locomotives, sharing of photos and news, time tables etc. You can join the discussion group here. Two photos added to the post today. One under 1883 and another with the exact year unknown but circa 1900s. Both photos can be seen in the section “Historic Photos of the Bridge” of the post. Shakoor Saheb. thanks. Yes I am very interested in looking at Attock bridge photos and possibly share them at these pages if possible – with credits to you ofcourse. Excellent historical description of the Attock Bridge. I have read your other articles as well. They are all quite informative and good to read. Keep up the fine work. 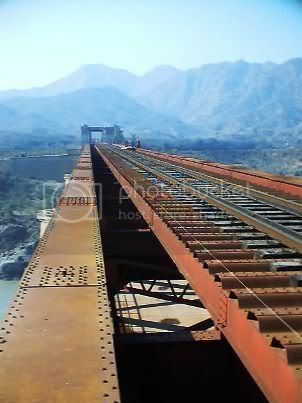 I took a few pictures of the Attock Bridge in 2007 during my visit to Pakistan. If you are interested, I would be glad to send you copies of the same. 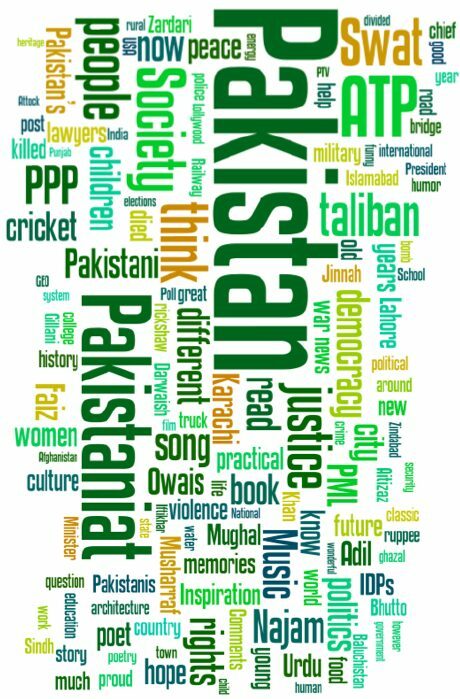 While All Things Pakistan has remained alive and online, it has been dormant since June 11, 2011 - when, on the blog's 5th anniversary, we decided that it was time to move on. We have been heartened by your messages and the fact that a steady traffic has continued to enjoy the archived content on ATP. While the blog itself will remain dormant, we are now beginning to add occasional (but infrequent) new material by the original authors of the blog, mostly to archive what they may now publish elsewhere. We will also be updating older posts to make sure that new readers who stumble onto this site still find it useful. Picture Perfect: Is this Pakistan’s Prettiest Railway Station? All Things Pakistan (ATP). Established June 11, 2006. Founding Editor: Adil Najam. Managing Editor: Owais Mughal.